Craftsman homes are timeless, but that doesn't mean that you have to live with ghosts of design past. Luckily, it only takes a few simple upgrades to bring your vintage digs into the present. And the heart of your humble abode, the kitchen, is a great place to let the makeover magic begin. 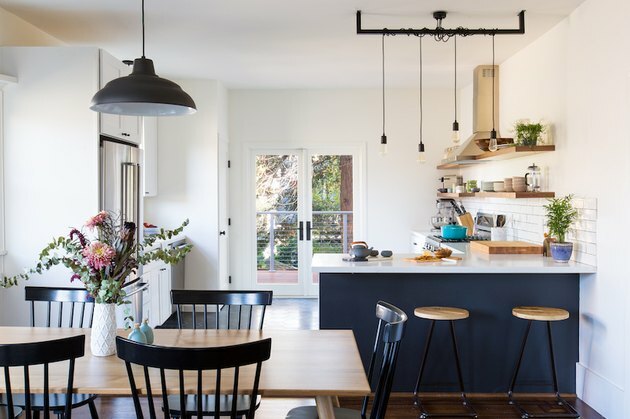 Here are eight piece-of-cake ways to give your Craftsman kitchen a beautifully modern redux. 1. Freshen things up with white. 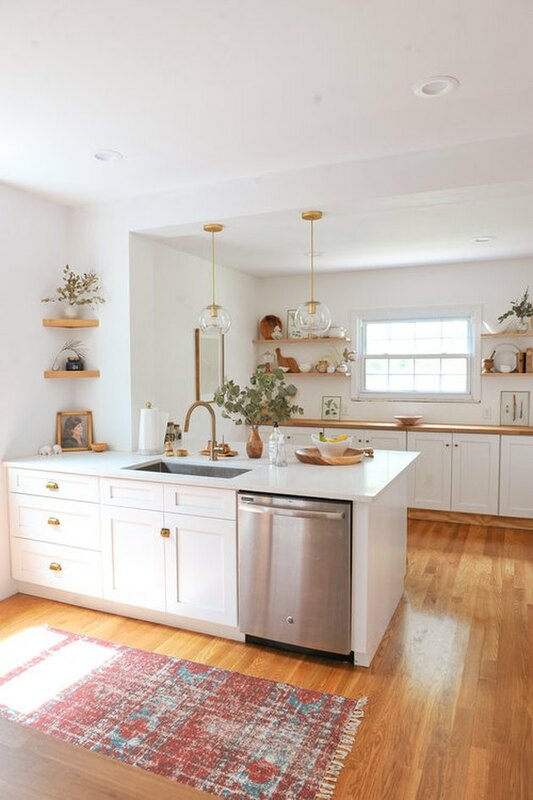 A white kitchen is the dream for many of us, right? It's also a lot easier to achieve than you might imagine. No, you don't have to gut everything and start from scratch. Instead, spend your money where it matters and make small improvements. Refresh walls and cabinets with white paint. Swap blah window treatments for sheer ivory panels that let in tons of natural light. 2. Install a tile backsplash. Want to make your space pop? 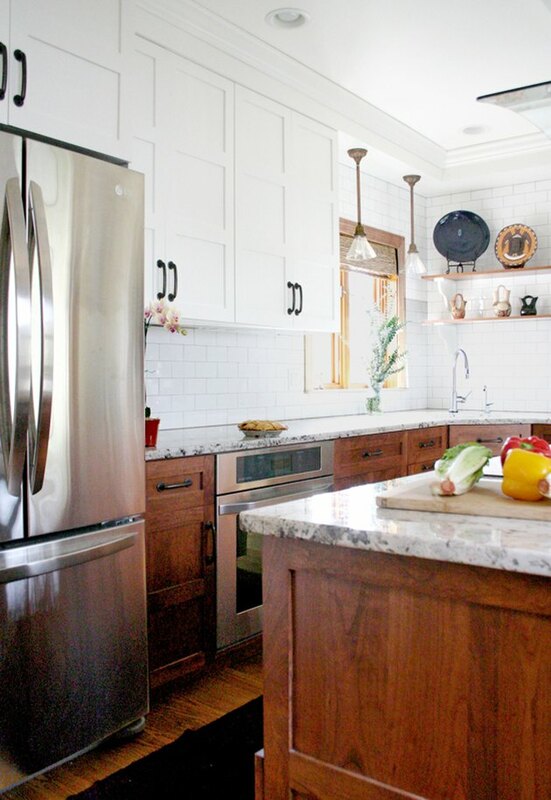 Splurge on a tile backsplash. 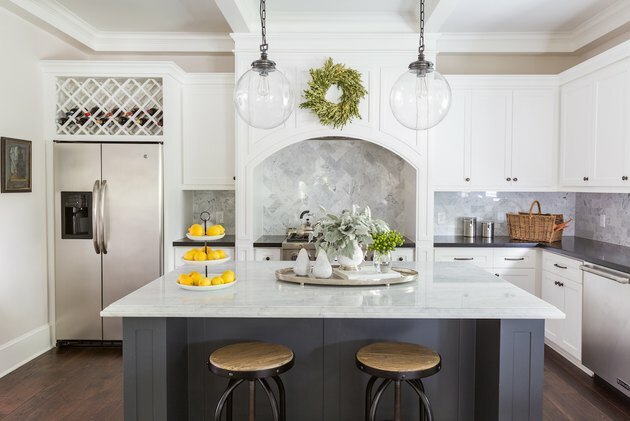 We love the tonal variation and texture of the polished Carrara marble subway tile in interior designer Marie Flanigan's kitchen. Herringbone is another modern option. What's old is new. Chip and Joanna Gaines utilize unexpected touches to introduce modern whimsy into this 1905 Craftsman abode — without sacrificing original character. The result is a room you'll look forward to making meals and memories in for years to come. 4. Consider a two-tone paint job. For something unique and surprising, opt for a two-tone paint job. 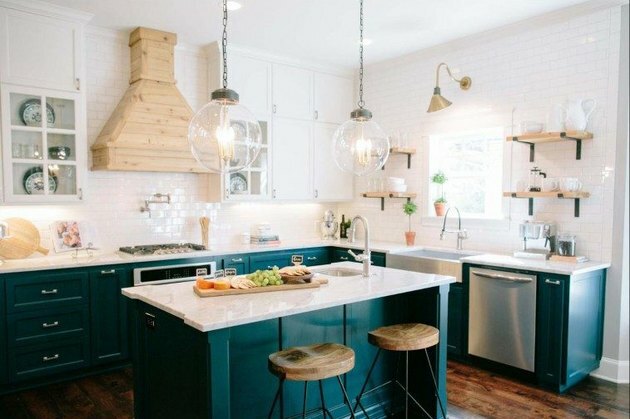 We absolutely love the combination of crisp white set against the richness of the midnight blue bar in this Craftsman kitchen. Light wood elements and plenty of plants round out the aesthetic. The kitchen is the heart of your home. And while a gourmet range and stainless steel fridge are great, the last thing you want is to lose that inviting quality. Follow photographer Erin Kelly's lead and infuse homeyness and warmth with accessories galore displayed on open shelving. In all of the remodeling excitement, don't forget about the flooring. If your Craftsman kitchen didn't come with gorgeous hardwood floors, opt for patterned tile instead. 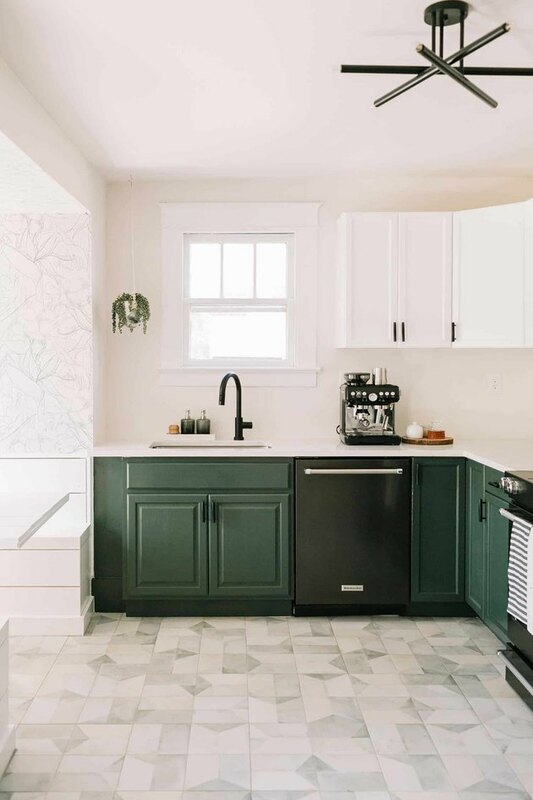 Elsie from A Beautiful Mess installed this geometric ceramic tile, which pairs beautifully with the green cabinets. 7. Pick a monochromatic palette. We've said it a thousand times, but it bears repeating ... paint can make a world of difference. 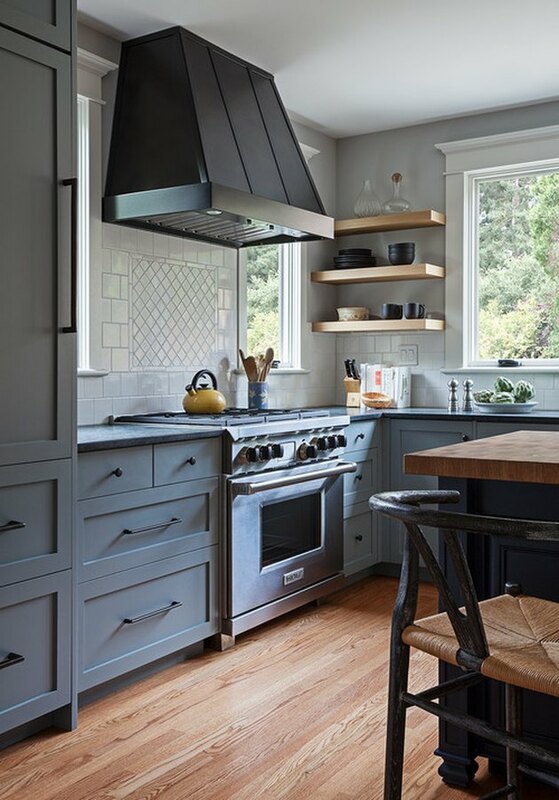 In this space by the team over at Sogno Design Group, slate cabinets and soft gray walls are the perfect pairing. Big windows keep it from feeling too dark. 8. Feature lots of wood. Wood is earthy and warm. It can also be a bit heavy, especially if used too liberally (without introducing elements to strike a balance). The solution? 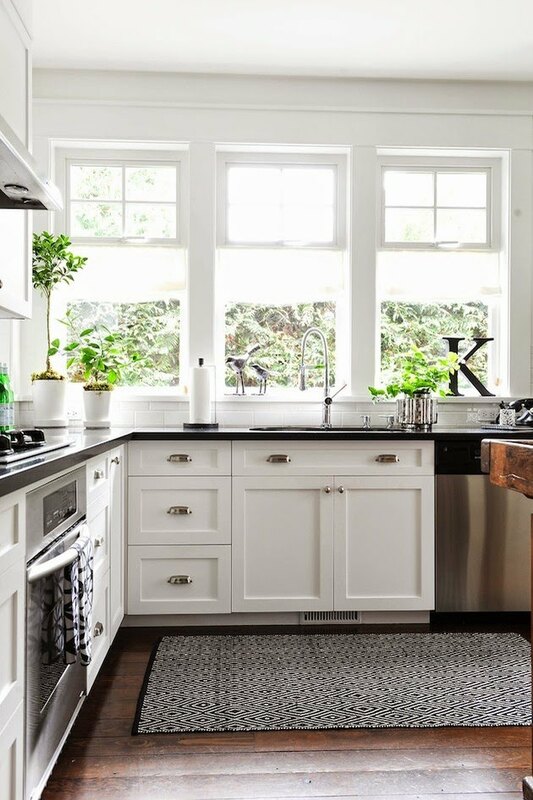 Whitewashed upper cabinets offset the richness of the cherry stain in this contemporary, country-inspired Craftsman kitchen by Naomi from Design Manifest.